The two machines at Animal Kingdom/Rafiki’s Planet Watch/Out of the Wild were removed in December 2012 to make way for a sandwich counter. According to cast members (and my search), the machines were not relocated and are now off-stage. There had been one quarter machine and one penny machine at that location. In addition, Beastly Bazaar closed around October. Its machine is also off-stage. 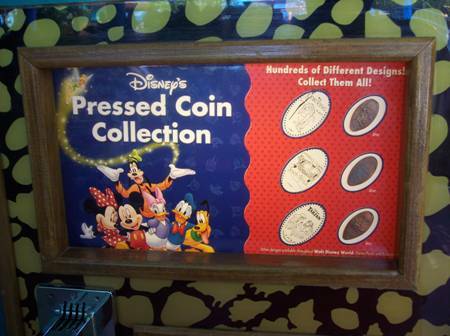 **The absence of these three machines means collectors will not be able to complete several themed sets: Lion King (pennies), Tarzan (pennies), and Friends (quarters). 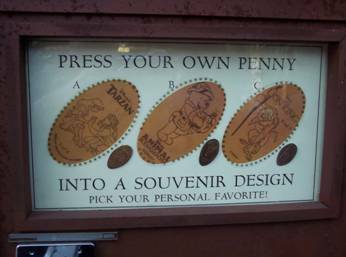 1/20/2013 update: The two penny designs from Rafiki’s Planet Watch are now installed on machine #1 at Duka la Filmu, replacing two dies that were repeats on that machine (Safari Minnie and Safari Tigger). 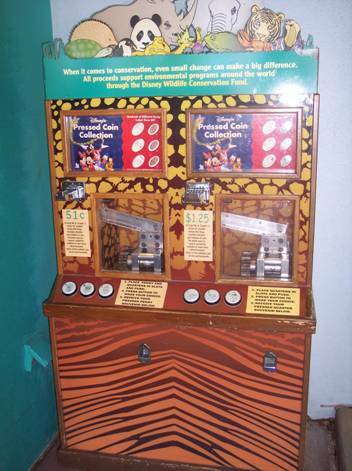 It is also expected that the dies from the Rafiki quarter machine will be relocated: 2 will go to the Grand Floridian (turning its 1-die machine into a 3-die machine), and 1 will replace Shere Khan at the Harambe Railway Station quarter machine in Animal Kingdom. 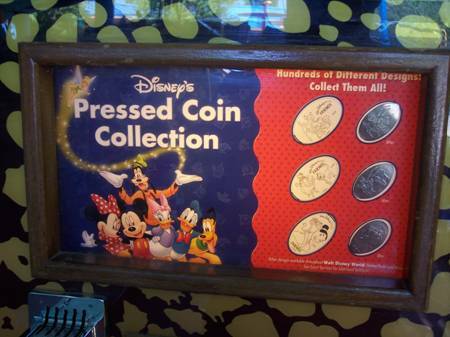 **This means the Friends set of quarters can be completed, but the Lion King and Tarzan sets will be incomplete due to the continued absence of the Beastly Bazaar machine and the absence of the Nala penny from the Lion King set. 2013 UPDATE: Two quarter designs formerly at Rafiki’s Planet Watch have been added to the quarter machine at Grand Floridian, so that machine has been converted from a single die to 3 dies. Shere Khan remains at the Harambe RR Station.